Take the next step in your Boise State experience. 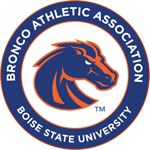 Join the VARSITY B; be part of the growing movement of former Broncos who are recognized as extraordinary individuals for having contributed to the Boise State athletic legacy. Fill out the form below to complete your membership or mail in the VARSITY B Membership Form (PDF). ARE YOU VARSITY B ELIGIBLE? VARSITY B is an exclusive group, specifically designed and managed by and for former Boise State student-athletes. If you do not meet eligibility for membership, your membership cost may be considered a donation, may not be available for refund, nor eligible to receive benefits. To ensure your eligibility in VARSITY B, as well as to keep you up-to-date with exclusive VARSITY B, please create an account or log in. The link will take you to another page and you will have to come back to VARSITY B after you have logged in.